This eye-catching bouquet captures the drama of love. Stunning roses in shades of pink and white are accented with brilliant white Asiatic lilies, tiny red buds, and whimsical brushes of baby's breath and set against a background of shining green banana leaves. 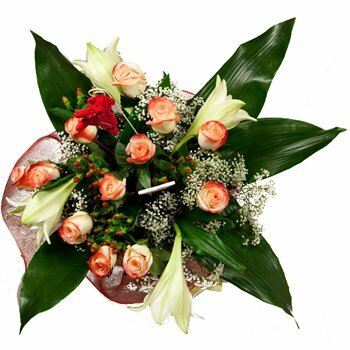 You'll warm her heart and win her over on any romantic occasion with the Frost and Flame Bouquet.